The FX markets have been fairly quiet so far this week and price action on the whole has been range bound. Indeed, after last week’s rally, safe haven Japanese yen pairs have all pulled back a little at the start of this week, despite the fact global equity indices have marched on higher. Thus, if we are to see the re-emergence of a trend in FX, it will likely be in yen pairs pushing higher along with stocks. With the likes of the USD/JPY, EUR/JPY, AUD/JPY and CAD/JPY all pushing higher for 3 consecutive weeks, I wouldn’t be surprised if any of these pairs were to turn around now and push higher again. Among the yen pairs, the EUR/JPY will be a good one to watch for further developments this week, ahead of the Eurozone PMI data on Thursday. Technically, this pair looks somewhat bullish after it broke above its short term bear trend and resistance around 125.45 to 125.70 last week, before stalling at 126.80. The 125.45-125.70 range is now the key support area that needs to be defended to keep the bullish trend intact. 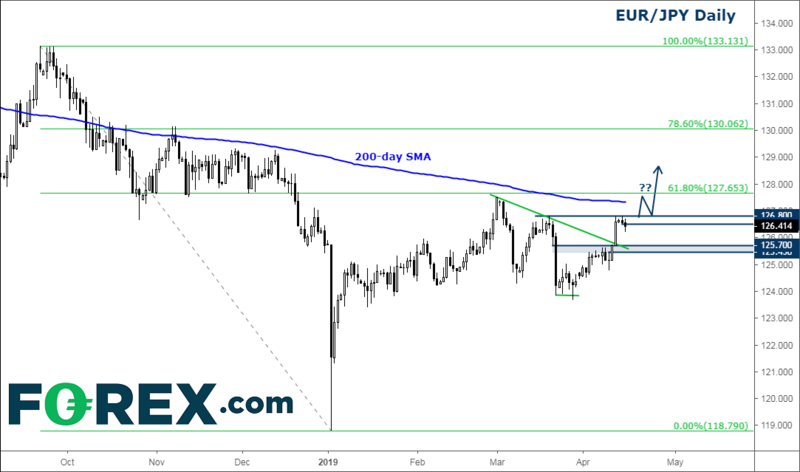 Meanwhile, any move above the 126.80 level is likely to trigger further technical buying, initially towards the 200-day moving average (127.32) or the long-term 61.8% Fibonacci retracement level (127.65).